This listing is for the PDF crochet pattern – NOT the finished product. 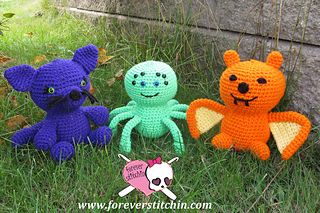 For this project you will need to know basic crochet stitches – increasing and decreasing. The pattern includes instruction, as well as a picture guide when necessary. The completed character will stand approximately 8 inches tall. 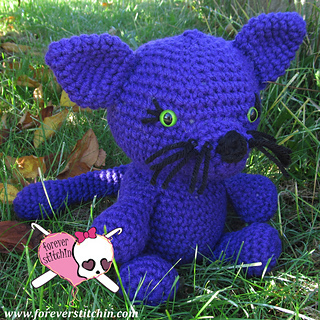 You will need Purple & Black yarn, optional: Green yarn or 2 12 mm Green post eyes., I/5.50mm crochet hook and a tapestry needle to complete this pattern. You do not have permission to copy, alter, sell or redistribute this pattern without my consent. You are free to sell the made item but you must use your own photos. Please credit Forever Stitchin and link back to my shop when you use this pattern.